The genius, and quite awesome guy, David Malki over at the wonderful Wondermark webcomic has created a very important list of supernatural collective nouns that should help us all out in our everyday lives quite often. 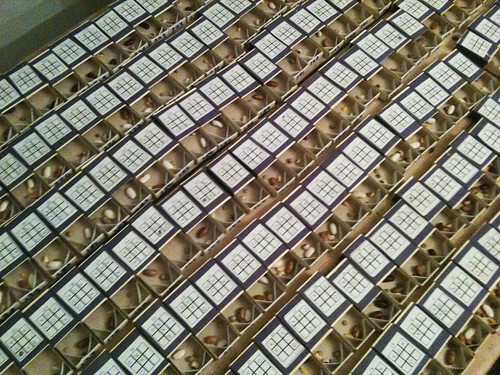 MENACE is a machine that plays noughts and crosses, built out of 304 matchboxes. Each matchbox corresponds to one of the 304 board layouts that the opening player might face (there are actually 19,683 possible board layouts, but we only need to calculate the opening player’s first four moves, and many are rotationally or reflectively identical). In turn, each matchbox contains a number of glass beads corresponding to each possible next move. When it is MENACE’s turn to play, the operator simply selects the matchbox corresponding to the current state of play, shakes it, and opens it to see which move has been chosen. Each matchbox contains a small nook into which one bead falls—and MENACE plays in the square corresponding to that bead. But what’s really clever is that MENACE learns. Every time it wins a game, an additional bead is added to each matchbox played, corresponding to each winning move. Likewise, every time it loses, a bead corresponding to each losing move is removed. As a result, over time, MENACE becomes more likely to play moves that have previously resulted in wins and less likely to play moves that have resulted in losses. Michie probably built the machine himself, although I haven’t found any reports of this, and it may have been a thought experiment and a pen-and-paper calculation. In fact, while there are many simulation programmes for MENACE out there, I couldn’t find a single actual machine.